Istanpitta is a United States based ensemble performing music of the 10th to 14th century Middle Ages including many traditional Middle Eastern dance tunes. The ensemble consists of 3-5 musicians playing a variety of period instruments including oud, lute, saz, early percussion, shawms, recorders, transverse flutes, krummhorns, vielles, Medieval harp, bagpipes and voice. The ensemble performs live at formal concert venues, universities, and festivals. Istanpitta was formed by Al Cofrin during the summer of 1994 as a means to perform interpretations of medieval dance music developed as part of a college thesis project at the University of Texas. 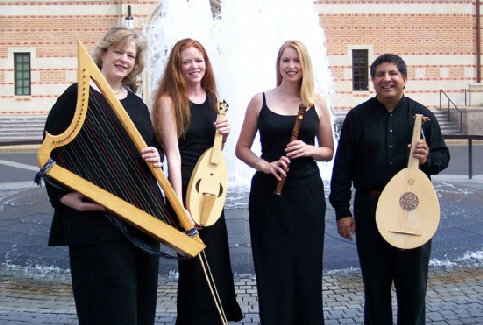 Eventually the ensemble was performing regularly across the United States venues geared towards early music. The main core of the group comprises the use of the medieval lute, vielle, bagpipes, recorder, percussion and voice. Their performances present the music in a manner that medieval musicians (who were somewhat low on the social scale) might have played them when performing for their next meal as they traveled from place to place across Europe. This includes incorporating many Arabic styles that were possibly familiar to the medieval ear due to the occupation of southern Spain by the Moors from the 8th century through the 15th century and the interaction with Middle Eastern culture during the Crusades. The theory here is that these musicians, like modern day jazz players, would not have limited themselves to the written or learned version of a tune but would have modified it in ways to make it their own. Many times this was done accidentally because many musicians were illiterate, and variations of a dance or song were recalled differently from one performer to another. Istanpitta’s interpretations of these songs and dances are meant to represent not the static literary versions (the words and music most likely transcribed onto parchment by a monk or nun) but the dynamic historical reality of the musician in the field.